Through a generous gift to Duquesne students, recently retired faculty members Steven and Agnes Várdy have established The Drs. Steven Béla Várdy and Agnes Huszár Várdy International Research and Study Grant. The fund promotes international academic work and broadens students' global awareness by providing an annual financial award to a leading graduate history student or undergraduate history major who conducts overseas research or studies abroad. 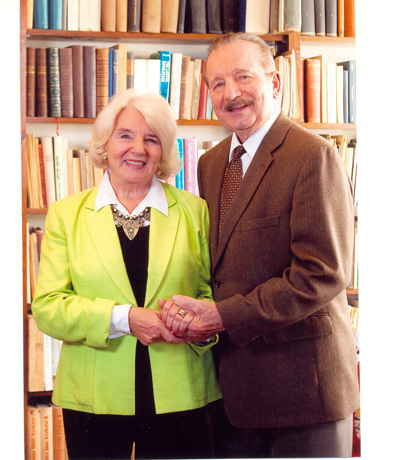 The Várdys have devoted much of their life to research, travel, and teaching their students to be globally conscious. They have taught thousands of students in the past four decades. On several occasions they took students abroad, visiting Germany, Great Britain, Austria, Hungary, Italy, the Czech Republic, former Yugoslavia, Greece, Turkey, Egypt, and many other countries. This international experience transformed these students into individuals with a broader outlook and more complete understanding of the world. The Drs. Steven Béla Várdy and Agnes Huszár Várdy International Research and Study Grant provides $1,170 to support one graduate History or Public History student in conducting research overseas between July 1, 2018, and June 30, 2019. The Department of History will provide up to an additional $500 to the winner of the Várdy Grant for a total of $1,670 in research support. These monies can be applied to any aspect of overseas research, including but not limited to airfare, local transportation, accommodations, food, and photocopying. The winner is required to submit a 500-word report to the Department of History chairperson summarizing the results of their research/study trip within four months of their return to the United States. Questions about this award can be directed to the Department Chairperson, Dr. John J. Dwyer at dwyer@duq.edu. The Várdy Grant winner should speak with the Department of History's administrative assistant, Ms. Kelly Kovalsky, regarding the disbursement of funds. Ms. Kovalsky can be reached at kovalskyk@duq.edu or 412.396.6470. 1. 750- to 1000-word abstract describing the purpose of your research trip. 2. Documentation of estimated costs of airfare, accommodations, etc. The award will be given out at the April 12th History Department Award Ceremony. Your gift in any amount will further extend Dr. Várdy's remarkable legacy. Help write their pages in Duquesne's history. Select "Designations" and then "Enter My Own Designation"